The Philadelphia skyline seen from the South Street Bridge over the Schuylkill October 1, 2017. 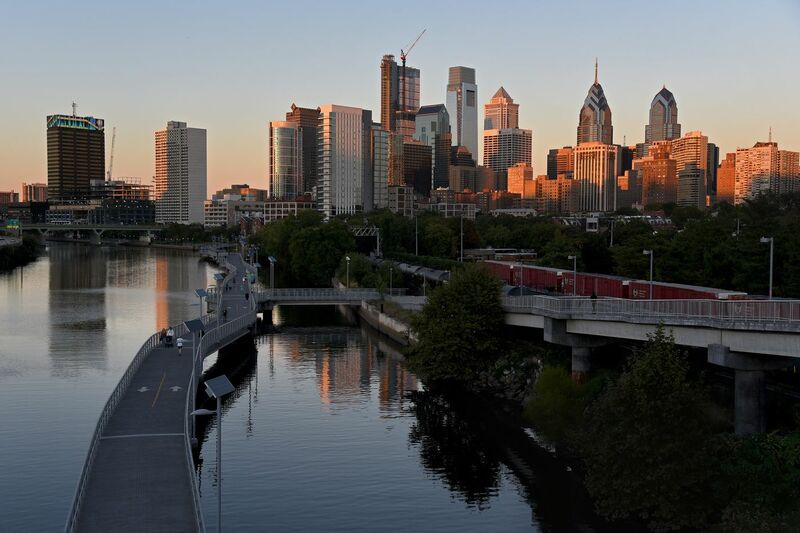 Making the short list of just 20 cities and regions out of a field of 238 that submitted proposals to Amazon has elevated Philadelphia on the national and international stage as a top choice for businesses, investment, and talent. Stakeholders from across the region worked for six weeks last fall on a proposal to attract one of the world's most successful companies to Philadelphia. Several dozen leaders representing different industries, interests, and counties formed a single team to act as one. The level of collaboration and focus on a common goal that happened during the HQ2 bid process was unprecedented, and now we are bringing that approach to other projects. The HQ2 process gave us the opportunity to dig deep on the data, and they show that the Philadelphia region possesses all the key ingredients any company would need to support its long-term growth. Our central location, excellent amenities, and affordability are all key to growth, but our greatest asset is our people. This region is driven by its diverse, talented workforce, which boasts 90,000 graduates a year from our 100 colleges and universities; produces more STEM graduates than all but five metro areas; ranks first in tech workforce diversity; and has the third most vibrant startup ecosystem in the nation. In the months that followed our submission, the City of Philadelphia, the economic development firm PIDC, Select Greater Philadelphia, and other partners across the region experienced an uptick in interest from national and international companies, meeting planners, and tourists — several of which directly cited the Philadelphia Delivers proposal, website, and videos developed for Amazon as a driving force behind their interest. PhiladelphiaDelivers.com has received nearly 100,000 views, and its videos have been shared globally in pitch meetings and on social media. The process itself landed Philadelphia in positive stories in national news media, including the Wall Street Journal, the Huffington Post, the New York Times, Bloomberg News, CBS News, PBS NewsHour, and USA Today. We tracked nearly 7,000 stories highlighting or mentioning our region's bid, reaching an audience of 280 million and with a publicity value of an estimated $77.9 million. We will see the impact of this exposure for years to come. The momentum of our city and region has never been greater. Now — armed with new data, messages, tools, and a coalition of leaders more committed than ever — we are ready to continue sharing our value proposition with the world. Mayor Kenney and the City's Department of Commerce recently returned from a trip overseas with the Philadelphia Convention and Visitors Bureau (PHLCVB), Select Greater Philadelphia, the Pennsylvania Department of Community and Economic Development, and other partners to promote business, convention, meeting planning, and tourism opportunities in the Philadelphia region. Many of these same partners are working together to attract investment and maximize the benefit of the new Qualified Opportunity Zone federal tax incentive. We are also coming together to create a global identity for Philadelphia — a shared brand and messaging that will be used to attract people and businesses from around the world. While we will continue to attract employers to our region, we are also now more committed than ever to supporting fast-growing employers that are already here by having them serve as the anchors of an agenda focused on inclusive growth. We have learned so much about our strengths as a city and region. Looking through the eyes of a data-driven company that employs more than 500,000 people around the globe has shown us areas where we need to do more to position ourselves for continued success. Everyone reading this has the chance to be a part of Philadelphia's exciting new trajectory. You are our greatest strength and can be our biggest advocates, directly impacting our future. Check out PhiladelphiaDelivers.com — watch the videos, click through the data-filled maps, learn what distinguishes our region as the perfect place to grow a business and a career — and then share it. Most importantly, you — and your children and grandchildren — are our greatest assets. Thanks to you, our city and region are on the rise, and we are proud to be shouting that from the rooftops! Jim Kenney is mayor of Philadelphia. Harold T. Epps is commerce director of the Philadelphia Department of Commerce. John Grady is president of PIDC. Philadelphia's HQ2 Core Team also included Select Greater Philadelphia Council, the Chamber of Commerce for Greater Philadelphia, Campus Philly, PHLCVB, and VISIT PHILADELPHIA.